Interactive Brokers Canada is the Canadian arm of Interactive Brokers, an American discount brokerage firm. While several of the other Canadian discount brokerage firms are affiliated with or are a part of a major bank, Interactive Brokers is not bank-owned and is more geared towards active traders than “investors” per se. If you are an active trader, Interactive Brokers’ pricing structure can certainly keep your trading costs in check. One important thing to consider is the typical order sizes that you trade with and your typical trading volumes on a monthly basis, as there are slightly different pricing plans suited to each category. The required account minimums are also important to take note of. 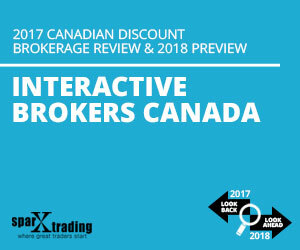 Now that there are registered accounts, Interactive Brokers just became incredibly more competitive with many of the other Canadian discount brokerages on price and functionality. With a heavy focus on active traders and on trading, this discount broker has platforms and pricing that cater to very active investor or trader. They have two pricing options for traders: the “flat rate” or the “cost plus”. The “flat rate” option charges $0.01/share with a minimum charge of $1.00 per trade for commissions + exchange, ECN and specialist fees (typically a few more cents); with the flat rate option the maximum charge you pay is actually 0.5% of the trade value (plus exchange, ECN & specialist fees). The “tiered pricing” option is pricing based on the volume of shares you trade per month. For example, the “lowest” threshold of volume they have is 300 000 shares or less in which they charge, on a per share basis, $0.0035 for US stocks, ETFs & Warrants or $0.008 for Canadian stocks. For the “cost plus” some extra charges are levied that approximate the ECN and exchange fees, so you will have to do some math to figure out the exact final charge you will pay if you decide to go this route. One of the biggest drivers of your cost using this option is whether your orders add liquidity or remove it from the market. A handy way to think of this is using market orders vs limit orders. More precisely buying/selling at the best market price (which removes liquidity) or placing an order outside of best market price (which adds liquidity). When approximating the cost, it’s best to use the “remove” liquidity function for your calculations. With this approximation in mind, the extra fees associated with the “cost plus” work out to $0.006 per share for US traded stocks at the lowest level of share volume. As of December 2014, Interactive Brokers Canada offers Registered Retirement Savings Plan (RRSP) accounts and Tax-Free Savings Accounts (TFSAs). This is a significant development for Interactive Brokers Canada as these account types have been long sought after by many Canadian clients. As of this writing (January 2015), the RRSP and TFSA accounts are available in Canadian and US dollars however direct cash deposits to registered accounts are only available in Canadian funds. Transfers from an existing brokerage account funded in US dollars to a registered account are accepted and will be held in US dollars (i.e. no forced currency conversion). Additionally, there is a quarterly maintenance fee of $12.50 for RRSP accounts. There are certain restrictions on the RRSP accounts that are not common at other providers, such as no support for the HBP or LLP. Be sure to read the full list of restrictions on their website for the most up-to-date details. Interactive Brokers has a robust trading platform that can handle simple to very complex order entries and strategies. Their primary platform is called ‘Trader Workstation’ or “TWS” and is available only to Interactive Brokers clients. Most notably, TWS is able to house both a practice (paper trading) account and live account in the same platform, so it is easy for users who wish to practice to do so in the full TWS environment. Another notable feature of the TWS is that it enable algorithmic trading so that users can create their own ‘automated’ trading rules to interface with the platform. In terms of features, the TWS is fully loaded with screeners, alerts, news and charting. The TWS is a desktop based system however Interactive Brokers also has a web browser-based interface, and a mobile trading platform. Finally, Interactive Brokers offers a demo version of the TWS for users to ‘test drive’ for free. This topic contains 3 replies, has 2 voices, and was last updated by Tim Dennison 5 months, 2 weeks ago. Would I still be able to continue actively trading during this process? IB doesn’t appear to offer a feed from the Canadian Securities Exchange. Is one being planned and when? I am a bit confused by IB’s commissions.Just as a general example, what would the commission be if I placed a buy order for 2500 shares of Medmen Enterprises be? (MMEN, trades on the CSE). Are you connected to any major Canadian bank so that funds could be easily transferred back and forth? Lastly, please strear me towards one of your sites where I could get info on the likes of the hours/times during which orders can be placed; Good ’til Filled orders; Buy Stops and trailing Stop-Loss orders; Placement of pre-market/after-hours orders; exposure to IPO’s; trading US Pink Sheet and/or OTC-listed ‘securities’; dashboard/trading platform and response times to the desk should I do something horribly stupid.Those sort of questions. I don’t doubt that anyone can argue with the capability of ‘Interactive Brokers’. Their ‘Service Representatives’ are the best I have ever dealt with. However, their application process is like a trip to hell and back. It has taken weeks to complete the process – delay-after-delay. If you don’t have a lot of patience don’t go there.